Seventy-three artists from 17 states have works featured in this year’s Rockies West National in Grand Junction, and five of them call Carbondale home. It was the first time Carbondale had such representation in the exhibit, now in its 26th year. That’s because it was the first time the Alaprima Painters decided to submit pieces. The Alaprima Painters — intentionally spelled differently from the painting style called alla prima — meets weekly on Thursdays in the Senior Matters room in the Third Street Center. Though most of the members specialize in watercolor, that’s not a stipulation. “Sometimes we’ll find someone doing pastel or oils or even leather work,” Engler said. They approached Carbondale Arts — back then it was still the Carbondale Council on Arts and Humanities, Milne noted — about using its classroom as a dedicated space for the endeavor. That got them started, and then Senior Matters emerged as an ideal host. “My husband is on the board of Senior Matters, and they were renting the room out [at the Third Street Center]. They said they’d be happy to have us in there once a week, and we’re just thrilled,” Milne said. “We have a very happy environment for painting,” Engler said, adding that it’s also a very popular one. “We have — you could call it a waiting list of people that want to paint with us, but we physically just don’t have the room,” she said. Currently, there are about 10 people that meet every week, many of whom are also art teachers in some capacity. The exhibit lasts the entire month of March by the Western Colorado Watercolor Society (WCWS), with an awards reception March 2. Nicolette Toussaint, an Alaprima Painter and Sopris Sun columnist and board member, won the Meininger Merchandise Award — a $100 prize. 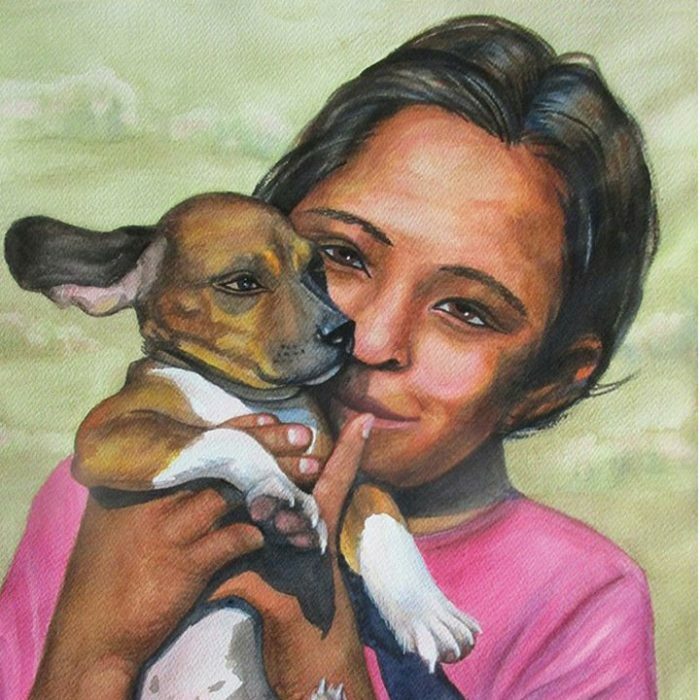 Toussaint received the photograph that inspired her “Apache Girl with Puppy” from her friend, Rebecca Knight. Knight had been visiting the San Carlos Apache Reservation in Arizona with a nonprofit that was providing the tribe with veterinary care when she noticed the girl holding the puppy. “I would never have been able to do the painting at all without the wonderful eye and adventurous spirit of my friend,” Toussaint wrote in a Facebook post thanking Knight. “We ask people to send in two images, and we only pick one from each artist,” WCWS Vice President Dani Tupper said. “Then the images are sent off to our juror, who is a nationally known artist.” This year, National Watercolor Society Signature Member Fealing Lin, of San Marino, Calif., selected and judged the show.